(ACV-W01-10) Works with Azusa 2272A Brake Assemblies. 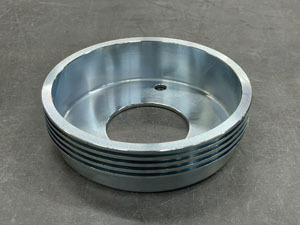 Upgrade your standard Azusa brakes with these AeroConversions Machined Brake Drums. These drums run true for greater stopping and holding power, and include cooling fins for consistent braking power during periods of extended braking. Zinc-Plated finish (discontinued black oxide finish shown). Bolt-on upgrade. As a set, these drums weigh 14.8 oz. more than the standard Azusa 2211 brake drums.